CVS Caremark, the largest provider of prescription drugs in the United States, plans to stop selling cigarettes and tobacco-related products across the nation by Oct. 1. 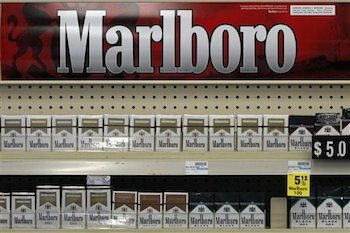 Feb. 5 (Bloomberg) — CVS Caremark, the largest provider of prescription drugs in the United States, plans to stop selling cigarettes and tobacco-related products across the nation by Oct. 1 in an effort to support the health of its patients and customers. CVS, operator of 7,600 pharmacy stores in the U.S., would be the first national pharmacy chain to take this step, the Woonsocket, Rhode Island-based company said in a statement today. The decision will cut annual revenue by about $2 billion, equating to 17 cents a share, CVS said.